Meeting location: St Paul's UCC Christian Ed. Bldg. Celebrating 63 years of Scouting in 2019! Welcome to Troop 595, Birdsboro oldest and finest Troop!!! We are celebrating 63 years of sharing Scouting with the young men of the Greater Birdsboro Area. We are a youth run troop with an active outdoor program which builds on traditional ideals of the Scout Oath and Law. We meet on Mondays and offer various traditional and non-traditional events. Some traditional events include: year round camping, including a week of summer camp, First Aid meets, Klondike Derby, conservation service projects, hikes, merit badge colleges, participating in American Legion flag ceremonies, Order of the Arrow and Court of Honors. Other events that we enjoy are: Lazertag, White Water Rafting, Joanna Furnace events, Fighting Phils games and sleepovers, tours of Gettysburg and Washington DC, Wildwood NJ Beach Jam and Knoebels Scout Day. As you can see, we have something to interest every young man wanting to share the excitement of Scouting. We have the honor of mentoring many young men. In fact over the last ten years alone, 19 young men have earned Scouting's highest rank, that of Eagle Scout. This is earned by less than 6% of those who join Scouting, so an honor indeed! Perhaps your son can join that exclusive club. See our Honor Roll below. Please contact us or stop by at a Monday meeting, We'd be happy to speak with you. Troop 595 is offering young men the opportunity to experience the excitement of Scouting for FREE! The Troop will pay any new Scouts first year registration fee and dues. A $90 value. We are confident that once your son experiences all that Scouting has to offer they will be hooked. Contact us at the link above or email Kurt Freer at kafreer@gmail.com or call 610-428-7085. 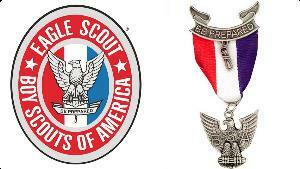 We have had 62 young men earn the Eagle Scout award since the troops inception in 1956. Perhaps you know some of them. If you do, congratulate them on their achievement. The Boy Scouts of America introduced new programs which welcome girls into the Boy Scout Program. The new program will start this fall with Cub Scouts and expand to the older scouts, now known as Scouting BSA in February 2019. For young women age 11-17 years old this will allow them to join the BSA and follow the same program currently in place for young men. This will give young women the chance to earn the Eagle Scout award. Young women will be part of a female only troop with separate adult leadership. This will not be a coed program. Female troops will be able to participate in any district, council or national programs such as first aid meets, Klondike derbies, camporee or jamboree, just like their male counterparts. Female troops will also be allowed to go camping with other troops, male or female. They will have separate campsites and will not share sleeping quarters. More to come as the start date gets closer. St. Paul's Church will have discussions regarding how this will impact the program we currently offer. If you know of young women who may be interested when available, feel free to contact us and we can share any information we have.